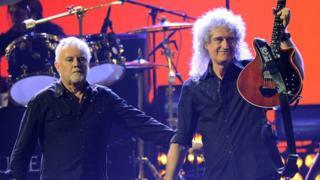 Queen have been honoured with the Living Legends award at the Classic Rock Roll of Honour awards in London. Guitarist Brian May collected the award at Classic Rock magazine's 11th annual ceremony at The Roundhouse in Camden. Queen recently celebrated the 40th anniversary of one of their biggest hits, Bohemian Rhapsody, and will headline 2016's Isle of Wight Festival. Other winners included Iron Maiden, AC/DC, Foo Fighters, Led Zeppelin, Alice Cooper and Noddy Holder. Queen, who originally consisted of May, Freddie Mercury, Roger Taylor and John Deacon, still perform live despite the death of singer Mercury in 1991. Previous recipients of the living legend award include Jeff Beck, Jimmy Page, Motorhead's Lemmy, Ozzy Osbourne, Iggy Pop and ZZ Top. Other winners on the night included Nils Lofgren - who plays guitar in Bruce Springsteen's E Street Band as well as having a solo career - who was honoured with the evening's outstanding contribution award. AC/DC, currently touring their latest album Rock or Bust around the world, were named band of the year. The album was the first in their 40-year career not to feature founding member Malcolm Young who is suffering from dementia. Iron Maiden won the album of the year award for The Book Of Souls. It was released in September after being delayed to allow singer Bruce Dickinson time to recover from treatment to remove a cancerous tumour at the beginning of the year. Led Zeppelin won reissue of the year for the re-release of their back catalogue in a deluxe box set. Foo Fighters' Sonic Highways documentary, which saw them touring recording studios around the US to make an album, won them the award for film or DVD of the year.